The comic is a map with the (rough) outline of the mainland of the United States of America. 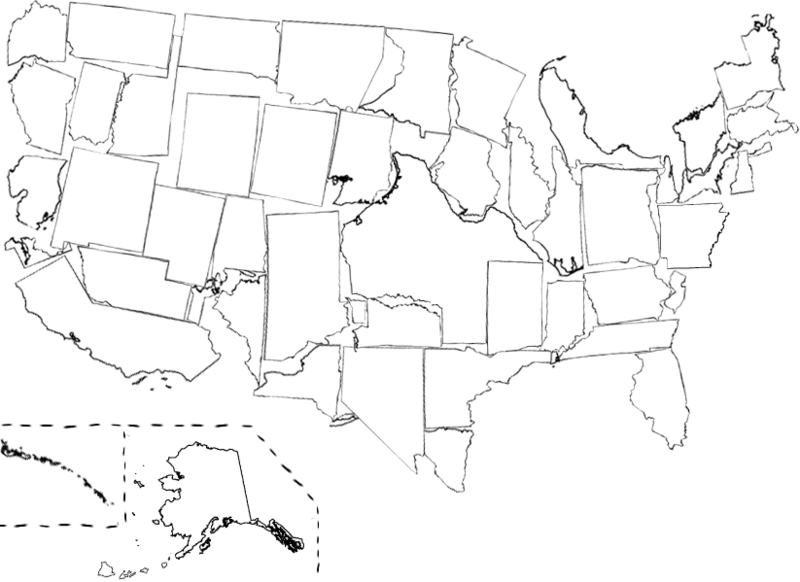 At first it looks like the real map, but actually all the states have been shuffled around in it. It seems that Randall took all of the states (minus Alaska and Hawaii, the two states that are not part of this map and are only mentioned in the title text, see below), and then reassembled them in the style of a jigsaw puzzle, with the end result being a map with a similar outline to the original unaltered mainland state map. They can thus be reassembled into the real map as can be seen here (see also the trivia section). Previously Randall has played with the shapes of the United States in 1079: United Shapes. In that map he did two separate drawings for Michigan with a mitten in the lower part and an eagle in the upper part. Once again in this version he has split Michigan in two, the lower main part, the mitten just labeled Michigan, is on the west coast on part of California's location, but the upper part is located on the east coast over New York's location and has been labeled MI (upper). So even without Hawaii and Alaska, there are 49 "states" in this map, consisting of 47 states plus the two halves of Michigan. In the table below all 49 states in the map has been listed to indicate where the puzzle pieces have been moved to. It seems at a first glance that the names have been written on the states as they would appear in a normal map, and that they have all then been rotated with the rotation of the states. But this is not the case for all states. For instance it seems like Utah has hardly been moved at all, and with the name written normally this may be intentionally to deceive the readers. Because Utah has been turned upside down, and according to how for instance Texas, clearly turned upside down, has its name written upside down as well, Utah should thus also have been written like that. It seems likely that this could be a trick by Randall, to see if anyone spots that Utah has actually been moved. But it could of course be a mistake, as seems more likely with Montana where the same "error" has occurred, but since this state has been moved far from its real position there would be no sport in doing so (see the trivia section). Of course there is the possibility that "Utah" was on purpose and Montana by mistake. With 47 of 49 ending up rotated as expected on the map and only two exactly upside down, there can be no doubt that it was on purpose that the names in general have been written according to the states rotation. Note that for instance the state California has been rotated, but in a way so the text is written normally. But due to the direction of the state, it is normal to write the name tilted down along the state, which just coincidentally ends up being rotated normal in the position it has in the comic. 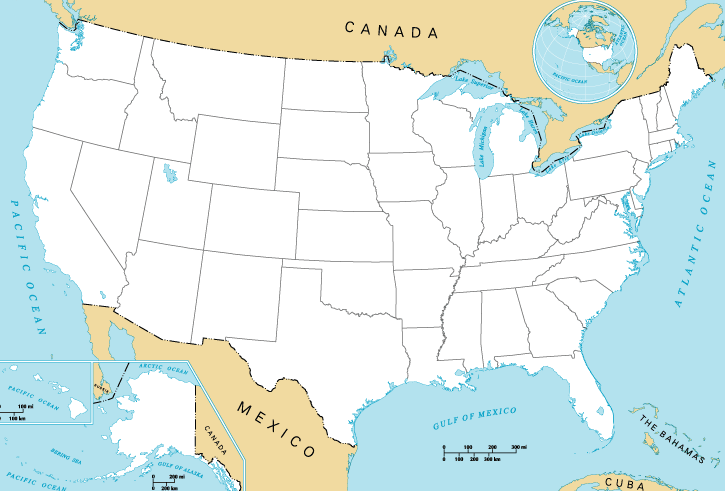 California has thus only been pushed down the length of the west border of the US (and thus rotated accordingly) so the top part still overlaps with the bottom part California, but also covers the bottom part of Arizona and New Mexico. Other states that likewise haven't been moved a lot include Maine which has only been rolled left (i.e. turned upside down) to just outside its normal position. 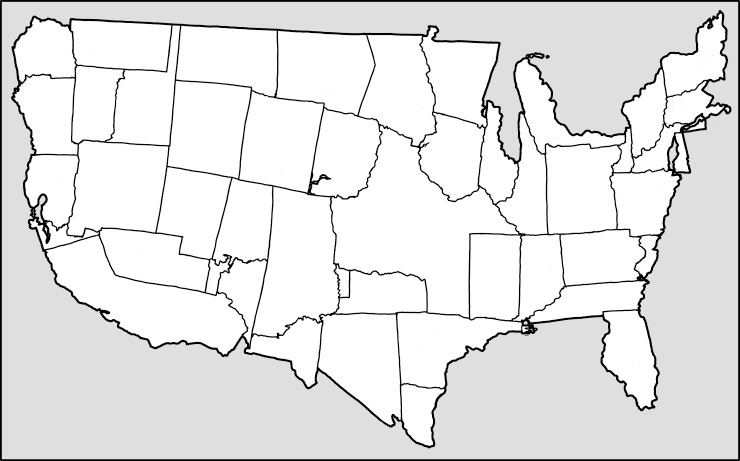 Colorado has been moved up a state to where Wyoming usually is, and Wyoming has then just been shifted right, still covering part of its original position. But both have been turned 90 degrees, whichever way would be impossible to say for these rectangular states, but the text, if you dare believe in that, seems to indicate they have been turned counter clockwise. Wisconsin has only been shifted down below its usual position but then turned upside down. 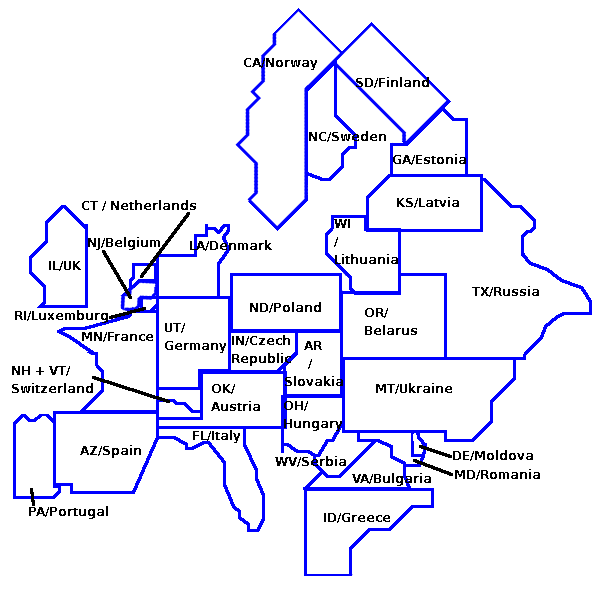 The title text mentions how it would be unfair to use a blank version of this shuffled-up map as a quiz for knowledge of U.S. geography (the link is to such a map created by a user of this site); most people recognize states primarily by their relative locations, not their shape (and especially not their shape after being rotated). It also suggests a corresponding mean trick to play if you include Alaska and Hawaii, which are not present in the comic itself, namely to interchange the volcanic island of Hawaii (consisting of 8 main islands and hundreds of smaller ones) with those of the Aleutian Islands, also a chain of volcanic islands (14 large and 55 small) that partly belongs to the US and partly to Russia. The island extends from the Alaska Peninsula. It would thus be possible to even make it difficult to correctly name these last two states, even though it would be obvious to begin with that it must be the two not belonging to the mainland. This table lists all states in the order of the transcript. But it can be sorted alphabetically. 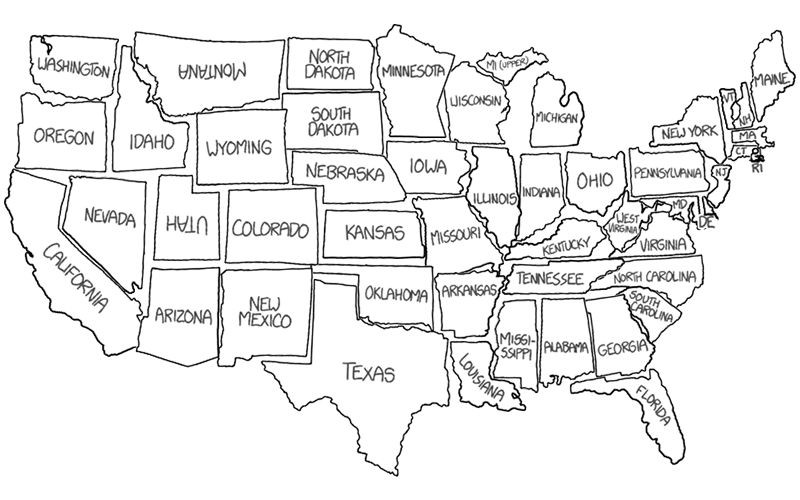 To list which state/states the states, in this comics map, have been moved over/inside. Finally it a note can be made for interesting swaps. Michigan (lower part) (as Michigan) Upside down Northern California Michigan is the only state split in two, as it is also split in two peninsulas in real life. In real life these two parts lie very close on the shores of the Great Lakes, and not as here, with one on each coast of the US. But at least they still both lie on a shore. Wyoming Rotated counter clockwise Eastern Wyoming Stays mostly in place. Utah Upside down Utah, Northern Arizona The text has been written upside down on the state, so in a correct map using this state the text would be upside down. Only other state this has happened with is Montana. Stays mostly in place. Montana Rotated counter clockwise Colorado, New Mexico and Texas The text has been written upside down on the state, so in a correct map using this state the text would be upside down. Only other state this has happened with is Utah. New York None Westernmost tip of Texas Missing Long Island. Minnesota Upside down Minnesota Stays mostly in place. Michigan (upper part) (as MI (upper)) Rotated 45 degree counter clockwise Pennsylvania and New York Michigan is the only state split in two, as it is also split in two peninsulas in real life. In real life these two parts lie very close on the shores of the Great Lakes, and not as here, with one at each coast of the US. But at least they still both lie on a shore. And this opposite map shows to what extend the states fit in Randall's layout when using the real borders. Using two A3 printouts of both the real map from Wikipedia and this comic, is approximately the same scale it was possible to reassemble US putting the states in their correct place. The result displayed surprisingly accurate drawings of the states, although it is clear that on the borders between states that are not drawn by a ruler, they cannot be correct for both states in all cases. From this map it becomes clear that not only Utah but also Montana has the text written upside down according to the correct position of the state. This comic may be an input to the way the voting districts in the US are so random that you can not guess where your vote will count. In this video Electoral College Ruins Democracy (by Adam Ruins Everything from November 2015), a map of the US is split up, much like this comic has done. In this case though the states do not move to a new location, but rather move apart to show the size of the state depending on how much your vote would count. The video is about how the Electoral College is assembled in order to elect the President and Vice President of the United States. At the time of this comics release (2016-03-09) the United States presidential primary elections to determine the candidates for the United States presidential election, 2016 was in full progress and not at all determined yet. Great map. Have linked from the explanation at the top. Also made my own real life jigsaw which I put in the trivia. This page was last edited on 15 March 2016, at 05:06.